In this classic tale, Richard E. Kim paints seven vivid scenes from a boyhood and early adolescence in Korea at the height of the Japanese occupation, 1932 to 1945. Taking its title from the grim fact that the occupiers forced the Koreans to renounce their own names and adopt Japanese names instead, the book follows one Korean family through the Japanese occupation to the surrender of the Japanese empire. 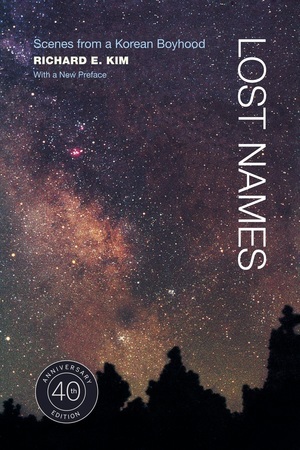 Lost Names is at once a loving memory of family and a vivid portrayal of life in a time of anguish. Richard E. Kim (1932 - 2009) was a celebrated novelist, essayist, documentary filmmaker, and professor of literature at University of Massachusetts at Amherst, Syracuse University, San Diego State University, and at Seoul National University. He was founder and president of Trans-Lit Agency, a literary agency devoted to establishing international copyright for works being published in Korea. His books include The Martyred (nominated for the National Book Award), The Innocent , and Lost Koreans in China and the Soviet Union: Photo Essays . He was recipient of the Ford Foundation Foreign Area Fellowship, a Guggenheim Fellowship, and a National Endowment for the Arts Literary Fellowship.